When I was growing up, after Chinese New Year, the question was what to do with the chicken used in making offerings to ancestors. Now, the question is what to do with leftover Thanksgiving turkey. A dish commonly made from the offered chicken is salted chicken. Each household spices it a little differently with salt, soy sauce, garlic and/or ginger. My grandmother would chop up the chicken with bones still attached into bite size pieces. She'd fry up the chicken and season it with salt. The salted chicken was kept in the kitchen to be eaten for several days to come. I often sneaked in and grabbed a few pieces because it was so delicious...crunchy and salty. This chicken would make you forget potato chips. After Thanksgiving, my leftover turkey with just the dark meat that is hard to carve becomes something delicious. I boil the turkey until the meat falls off the bones. Then I turn the meat into turkey chips...sort of. Any leftover roast, boiled, fried chicken or turkey works well for this recipe. Boiling the turkey is meant to remove meat that's stuck in small crevices and tenderize the meat. With the chicken, this step may not be necessary. I bake the chicken to minimize the amount of oil used and the time standing in front of the stove and maximize the crispiness. My grandmother fried the chicken pieces until dried and crispy. Cover the leftover turkey or chicken in a big pot with water. 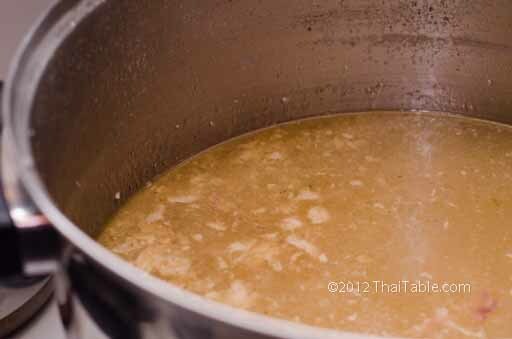 Let it simmer until the meat falls off the bone, about 1-2 hours depending on the size of your turkey. You'd be surprised at how much meat you can get from the turkey carcass. 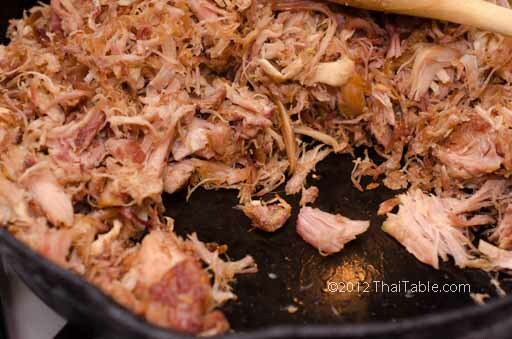 Scoop out just the meat and skin and add to a pan. Be careful with the small bones -- as you see them pick them out. If you love the crunchy skin on roast chicken, you'll love crunchy turkey skin! 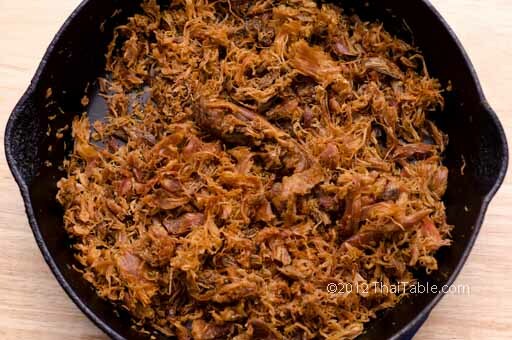 I use a cast iron pan which works very well for going from the stove top into a toaster oven. Ladle the turkey fat into the pan as well. Over medium high, stir the turkey around and let the water evaporate. Break up the chunks into smaller pieces for maximum crispiness. 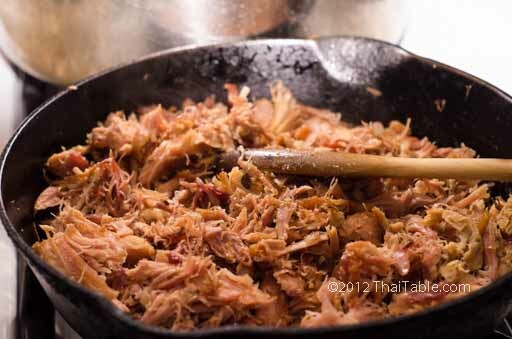 For 4 cups of turkey meat, I add 2-3 tablespoons of oil and almost 1 teaspoon of salt. Hold the salt until you have tasted your turkey. Add a small amount at a time. Add the oil and sprinkle salt all around the pan and stir to mix. It really doesn't need much oil. The fat also comes from the skin and skimming of the soup. After the water has evaporated, the turkey will turn reddish brown. This should take about 15 minutes. You can see that there is no water and not much oil on the pan (picture 3). Take the whole pan and place it in a toaster oven at 350 degrees for 20-25 depending on how dry your turkey was going into the oven and how crunchy you want your turkey to be. While the turkey is in the toaster oven, you may want to stir and flip to get the meat to evenly dry. I set my 'turkey chips' on the table knowing it will be gone in no time. You can also serve the turkey with rice, rice porridge or sticky rice. Let the turkey cool completely before storing in an airtight container. I store mine outside the fridge which keeps it crunchy for a few days. I would not recommend storing it outside of the refrigerator unless your turkey is completely dry (very crunchy). It can be reheated in the toaster oven in a pan for a few minutes to return the crispiness.